Eww, get out of here ranger! i'm sorry, i can't hear you over the sound of my 13.75 seconds of continuous disable. I'd suggest wearing a mix of Rabid / more rabid / Apoc and dire. can pretty comforably hit 45% crit, 1300 condi damage, 17.5k health and 2.9k armour. This is the condi roamer build that we normally try to run on our necros for group fighting. The main differences between these builds is the amount of party support you have. The first build is heavily focused on boon ripping, and yours is more condi focused. Plague Signet is pretty much a suicidal skill unless the group runs seriously high aoe condition clear, depending on the enemies you're fighting, you can kill yourself very easily because you only have so much condition transfer. Instead I put Flesh Wurm in that slot for more mobility in combat. 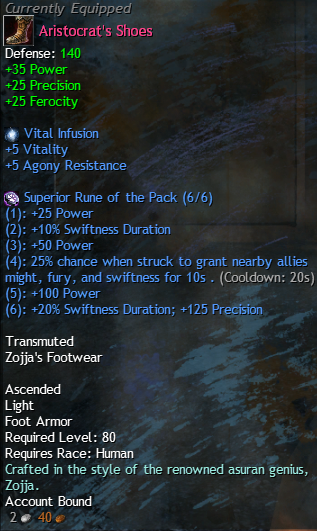 Power stat on a full condi necro is somewhat useless, so instead of carrion I switched it to Rabid, giving you more crit chance to take advantage of your bleed on crit. I also changed your amulet and back to Dire rather than Celestial, because having only two pieces of Celestial stat isn't going to do enough for you to justify the loss of toughness and vitality. How bout I go full cele on the trinkets? That way I dont need to invest money on two sets of trinkets and it is more flexible, lets say on a power build those work too? With celestial trinkets that i am able to get. Also changed staff for rabid. Otherwise that is what i propably will be playing and trying to evolve in coming months. Hey folks. I enjoy Engineer, and I was turned onto a particular trait combination by Labby. Static Discharge is a potent trait that can enable an Engineer to burst with the best of them, and it's very fast burst that rivals and in some cases surpasses thief. I believe though that this build is often taken to far in the offensive direction under the philosophy of kill or be killed. These are sort of the given's of the meta SD build. I think that's foolish. Elementalist can run a Berserker amulet in PvP for certain builds, and gets away with not being thrashed too hard with a combination of strong defensive cooldowns, as well as some very potent traits in their bottom two lines, Water and Arcana. I took this philosophy to SD Engineer, and found quite a bit of success with it. Static discharge and a Berzerker amulet, along with Fire and Air sigils, give the build the burst to be a contender. It doesn't need to go full offense in it's cooldowns and trait lines to be effective. I have not worked with any other fill in, but I highly recommend you get a stunbreak. Utility Goggles is a very potent offensive option, comes with a (longer) stunbreak, but I think of it as a "win-more" cooldown. You already do a considerable amount of burst, so adding more to it has less value overall to the build than a cooldown than you can use for defensive purposes. Rifle, rifle turret, and toolkit are the core of this build. This variant gives you some potent team support added to your turrets. Fury and AoE Vigor is rather nice. Supply Crate is already a strong Team fight skill, this adds even more kick to it via the Boons (Might, Fury, Vigor, Swiftness). The combination of traits as previously mentioned is Acidic Coating, Armor Mods, and Protection Injection. The build that can shut down the typical SD most under the current meta is Panic Strike thief. The typical opening for PS thief is their steal (Sleight of Hand to Daze, boon rip, and Thrill of the Crime boon blast), and then autos to attempt to burst the target down to 50% health. The Panic Strike kicks in, and they can finish cleanly with Heartseeker and more attacks. This opening grants you Protection (Protection Injection) because of the daze, and the combination of Armor Mods and Acidic Coating is very potent in canceling a their first few hits to close of that burst and give you a chance to respond. It has reasonable match ups in my testing, but do consider this a work in progress. Thoughts? Edit: A quick follow-up: Swapping out Experimental Turrets for Incendiary Powder would net you better results in teams that cannot make good use of the Boons. It also allows you to pressure Bunkers with more effectiveness. Later today I will post a "Legendary Celestial Engineer" here (tdm reference totally intended) that will change engineers for life.... Yea right! Just a cele build with soldier armor, pack runes and of course, celestial trinkets! It is gon be gud!!! If you publicly post builds, it means they're not good enough to worry about being copied. Which is why I don't link my mesmer build with 17 buffs incoming. Oh it is good, but how many times you can invent wheel again? Cele builds usually run knight or zerker with hoelbrak or strenght runes. This is totally different and with a lot of different traits and with a lot of thought by me and darktan considering group play.